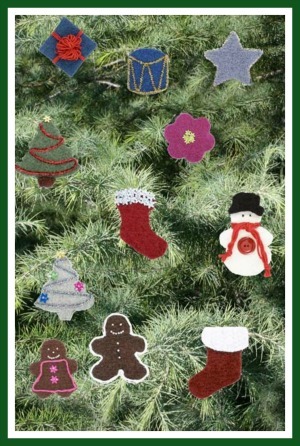 "How to felt, felted crochet"
Here are some really cute felted crochet Christmas patterns for little tree ornaments. This pattern explains how to make them in knit or crochet. Christmas crochet patterns included are stockings, drums, flower, snowman and gift ornaments. Designs by Coats Design Team. 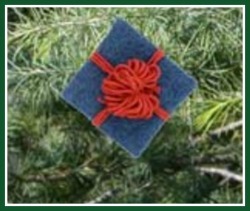 Finished ornaments measure approximately "3-5"
MODA DEA® "Bamboo Wool™": 1 Ball of each color desired for ornaments. Knitting Needles: 5.0mm [US 8] OR Crochet Hook: 5.5mm [US I-9]. Cookie cutters, clear nylon thread, tailors chalk, flower sequins, silver beads, metallic pipe cleaners, craft glue or sewing needle and threads. With crochet hook and desired color yarn, ch 60. Row 1: Sc in 2nd ch from hook and in each ch across; turn. Row 2: Ch 1, sc in ea sc across; turn. Repeat Row 2 until all yarn from 1 ball is used. Fasten off. Cast on 75 sts. Work in St st (Knit on right side rows, Purl on wrong side rows) until all yarn from 1 ball is used, leaving enough yarn to bind off. Bind off all stitches. Place knit or crocheted fabric in lingerie laundry bag and machine wash in hot water, preferably with bulky items (i.e., denim jeans) that have been washed often and won’t bleed. Repeat washing until fabric is dense, and individual stitches can’t be seen. Crochet Snowman: (3116 Ivory and 3012 Black fabrics) Draw and cut out snowman shape from Ivory fabric. Draw and cut out hat shape to fit snowman’s head from Black fabric. 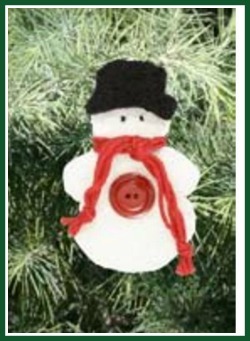 Sew or glue onto snowman. Tie a few strands of 3920 Chili Pepper around the neck for a scarf. 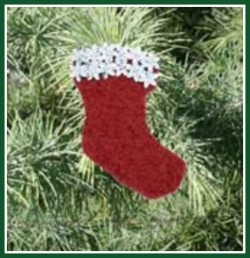 Crochet Christmas Stocking pattern: (3920 Chili Pepper and 3116 Ivory fabrics) Draw and cut out boot shape. Draw and cut out furry piece for the top of the boot. Sew or glue to top of boot. Flower: (3702 Boysenberry fabric) Draw and cut out flower shape. Sew on Flower Sequins (SPN 2016 Flower Multi) Use silver beads (BEA4470) to anchor the sequins. Gift: (3845 Blue Velvet fabric) Draw and cut out box shape. Wrap 3 strands of 3920 Chili Pepper around square to look like a gift. Make a bow with 3920: wrap yarn around 2 or 3 fingers several times; tie a separate piece of yarn around the center of the yarn bundle. Attach to gift. 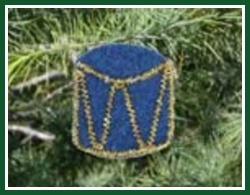 Drum: (3845 Blue Velvet fabric) Draw and cut out drum shape. Bend gold pipe cleaner (CHE230) to outline edge of drum, and to form zig-zag pattern in center. Sew or glue in place. 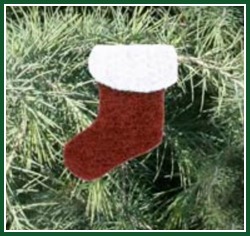 Glittery Stocking: (3920 Chili Pepper fabric) Draw and cut out stocking shape. Sew silver flower sequins (SPN2016) on the top of stocking using silver beads (BEA4470) to anchor the sequins. Large Christmas Tree: (3650 Bamboo and 3365 Coffee fabrics) Draw and cut out a tree shape from Bamboo fabric. Draw and cut out a small piece of Coffee fabric for a trunk. Sew or glue to base of tree. Bend a red pipe cleaner (CHE332) back and forth across the tree to look like garland. Sew or glue in place. Sew gold flower sequin (SPN2016) to top of tree using silver bead (BEA4470) to anchor sequin. 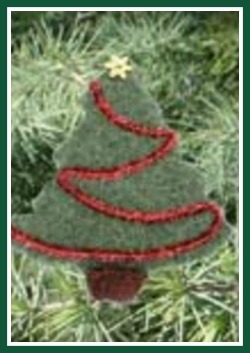 Small Christmas Tree: (3620 Celery fabric) Draw and cut out a tree shape. 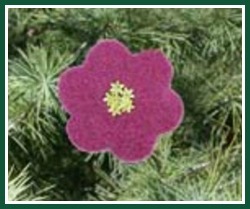 Bend a silver pipe cleaner back and forth across the tree to look like garland. Sew or glue in place. 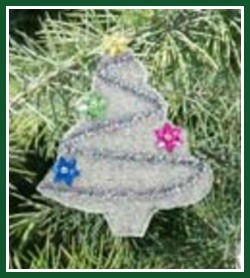 Sew a few different colored flower sequins (SPN2016) scattered around on the tree using silver beads (BEA4470) to secure the sequins. 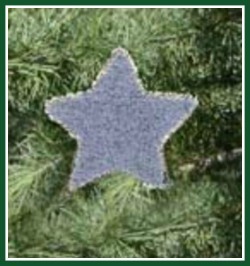 Blue Star: (3530 Periwinkle fabric) Draw and cut out a star shape. Bend a silver pipe cleaner (CHE231) to match the outline of the star. Stitch or glue in place. 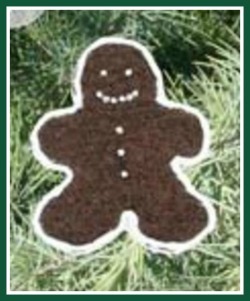 Gingerbread Boy: (3365 Coffee fabric) Draw and cut out a gingerbread boy shape. Outline the entire shape with 3116 Ivory. Sew or glue in place. Sew or glue silver beads (BEA4470) for eyes, mouth and buttons. 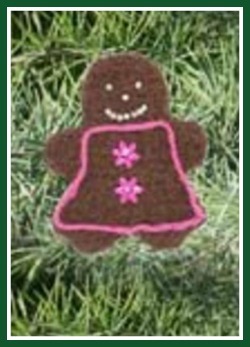 Gingerbread Girl: (3365 Coffee fabric) Draw and cut out a gingerbread girl shape. With a piece of 3702 Boysenberry, outline dress shape and glue or stitch in place. Sew or glue silver beads (BEA4470) for eyes, nose and mouth. Sew flower sequins (SPN2016) to dress front using silver beads to secure. Hangers: Thread a 12" piece of clear nylon through top of each ornament and tie ends together firmly. (4 Medium) MODA DEA® "Bamboo Wool™", Art. R167 (2.8 ounce/145 yard ball). ABBREVIATIONS: ch = chain; mm = millimeters; sc = single crochet.